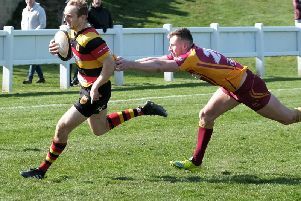 Harrogate RUFC produced a stunning fightback to earn themselves a draw on the road at Hull, keeping their slim hopes of promotion alive. Dave Doherty’s men trailed by 17 points at half-time and despite them hitting back early in the second period, a fourth home try in the 60th-minute left them looking dead and buried. Both ‘Gate, fifth in the table, and third-placed Hull have eyes on the promotion play-off spot that finishing as runners-up in National Three North would bring. Yet with an hour gone of Saturday’s contest, the Rudding Lane outfit’s challenge looked to be well and truly over. Come the final whistle, however, the Aces had a three-point haul to their name and were left cursing their luck that they weren’t able to go on and complete the most unlikely of victories. ‘Gate’s forwards edged the opening exchanges but when the ball was over-thrown at an attacking line-out Hull took possession and made their way into away territory. A driving maul followed and home prop Mike Dias burrowed over for a 5-0 lead. Andrew Lawson and Luke Edwards made useful breaks as Harrogate looked to respond, but the visitors failed to capitalise and Hull came again, showing a clinical edge with a second touchdown from another driving maul following a kick to the corner. The match continued to ebb and flow and a spell of ‘Gate pressure took them to within five metres of their hosts’ try-line. The Aces’ pack were causing all sorts of problems for Hull in the scrum, but they opted to kick to touch from a penalty only to lose possession from the subsequent line-out, squandering another promising attacking position. Play then switched to the other end of the pitch and the home team began to turn the screw. Frantic defence initially saw Hull repelled, but Edwards was sin-binned for an indiscretion at the breakdown and somwehat inevitably, the hosts made full use of their numerical advantage and moved the ball into the backs for centre Alex Heard to barge his way over. Fly-half Steve Johnson had shanked his first two conversion attempts, but found the target with his third, sending Hull into half-time with a commanding 17-0 advantage. It was crucial that Harrogate began the second period well, and, despite still being a man down, they lay siege to the home line during the opening moments of the half. A driving maul eventually took them over the whitewash and flanker Jonny Coser applied the finishing touch before Luke White converted for 17-7. Undeterred, Hull immediately re-asserted their authority with lock Liam Regardsoe powering under the posts and Johnson adding the extras to re-establish a 17-point gap on the hour-mark. The hosts continued to attack with real menace and another score looked on the cards, but ‘Gate weathered the storm and hit back with another unstoppable driving maul that rumbled over from distance for replacement prop Andy Boyde to touch down. White booted over the conversion to give his side a glimmer of hope at 24-14 with 15 minutes remaining. That score brought about a shift in momentum, and with the bit firmly between their teeth, ‘Gate set about dragging themsleves to within touching distance of the home side. From a penalty, White sent the ball to the corner and the men from Rudding Lane went with the tried and tested driving maul once again, second row Tom Harvey this time the man to dot down for 24-19. With Hull reeling, Harrogate continued to batter away and another catch-and-drive from a line-out saw the forwards keep the ball tight and launch attack after attack from just from a couple of metres out. With the ball right under the posts, it was eventually and reluctantly spread wide where Doherty’s pass released Olly Rosillo who dashed over in the corner to tie things up at 24-24 in the 79th minute. White then had the chance to win the day but was off-target with a difficult kick from close to the left touchline. There was still time for Harrogate to win themselves another penalty, only just inside the Hull half, but directly in front of the posts. Unfortunately for Doherty and his charges, referee Daniel Woods compounded a far-from-impressive display with the whistle by blowing for full-time and denying the visitors a chance to seal what would have been a fabulous comeback victory.